Linearized PDF is a special way to organize a PDF file. In general, the PDF is a very elegant and well-designed format. A PDF consists of lots of PDF objects which are used to create the pages. This information is stored in a binary tree which also stores the location of each object in the file. So only the tree needs to be loaded when the file is opened, and it can then be used to load the required objects to display a page. The whole file itself does not need to be read, only the tree. The location of the tree is always stored at the end of the file so it is easy to find and also simple to modify the file just by appending new information and a new tree. However, if the file is read via the web, it is accessed as a stream of bytes. 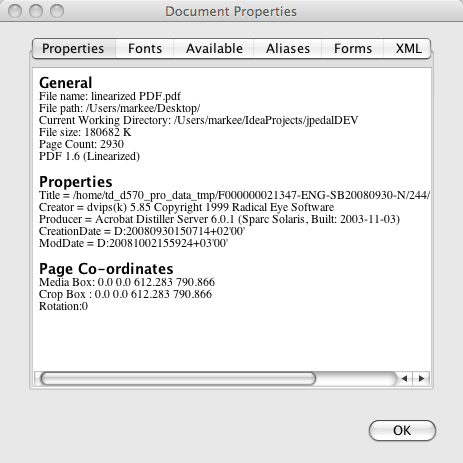 This means the reference (which is at the end of the file) cannot be read until the whole PDF file has been transfered. This can take some time with large files. So Adobe created a new way to layout the PDF called Linearized PDF. The file format is still the same, but there is a special tag at the start of the file and all the objects needed to create the first page (and a mini binary tree describing them) are stored at the START of the file. As soon as this data has been read, the first page can be displayed, while the rest of the file is downloaded. This makes the whole thing seem much faster and gives the user something to look at almost immediately even on huge files. 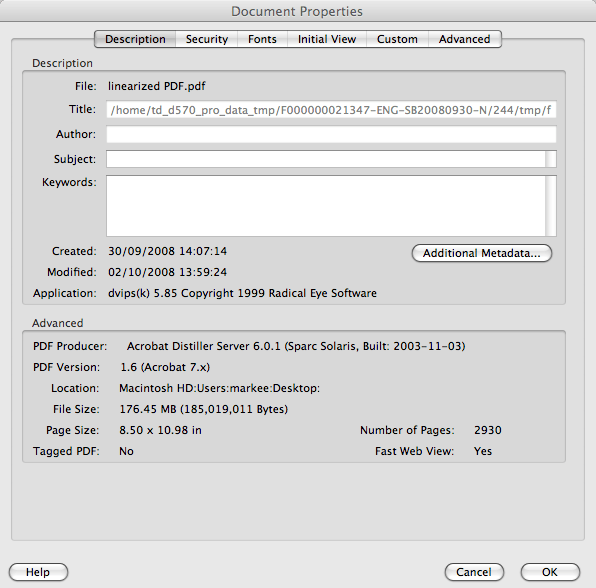 In Adobe Acrobat and Adobe Reader, the best way to see if a PDF is Linearized is to look at the Document properties. If the file is a linearized PDF, the item Fast Web View will display Yes. In JPedal 4.0.1, we have added a similar option so show if the file is Linearized to the Document properties. If it is Linearized, the word linearized appears in the general section after the PDF version. In JPedal you can also check progammatically to see if a file is Linearized by seeing if the Linearized object exists – if it does it is a Linearized PDF. Here is the code. So in a nutshell, Linearized PDF is a way of organizing a PDF file so that if it is going to be accessed over the Internet it will appear to load much faster. And it does this very well!